Draft: 2006, Minnesota Twins, 19th rd. Daniel Paul Valencia…at Spanish River High School (Boca Raton, FL), earned three 1st-team All-Palm honors…named team MVP, 1st-team All-County, and 2nd-team All-State as a senior; Offensive Player of the Year, 1st-team All-County, and 2nd-team All-State as a junior; and team MVP and 1st-team All-Palm Beach County honors as a sophomore…Freshman of the Year by Southern Conference Sports Media Association and 2nd-team All-Southern Conference selection while at UNC-Greensboro after hitting .338 with 8 home runs, 36 RBI and 39 runs in 55 games…transferred to the University of Miami…named to the All-Regional team as a sophomore in 2005 after batting .300 with 6 home runs, 15 doubles, 63 RBI and 39 runs scored in 60 games (56 starts at 1st base and 2 starts at 3rd base)…hit .324 with 9 home runs and 61 RBI as a junior. Hit .287 (135x471) with 72 runs, 22 doubles, 1 triple, 17 home runs, 51 RBI and 41 walks in 130 games with Oakland...Hit .318 (41x129) with 7 doubles, 7 home runs, 19 RBI and a .924 OPS against left-handed pitchers…his .924 OPS vs. LHP ranked 14th in the American League...Hit .317 (70x221) with 12 doubles, 1 triple, 13 home runs and 33 RBI in 59 road games…ranked 6th in the AL in road batting average (min. 200 AB)...Hit 3 home runs on May 15 at Tampa Bay, his first career 3-home run game… marked the 15th 3-homer game in Oakland history, 27th in Athletics history and the 2nd by an Athletics 3rd baseman (also: Pinky Higgins, 6/27/35 vs. BOS w/PHA)…also matched a career-high with 5 RBI (also: 9/25/10 at DET w/MIN)...Hit .359 (28x78) with 18 runs, 2 doubles, 8 home runs, 19 RBI and 4 walks in 21 games in the month of May…among American League leaders in the month of May, ranked T5th in home runs and 7th in batting…his 8 home runs in May are the most of any single month in his career (previous: 5, 2x, last: August 2015 w/OAK…hit 6 home runs with Oakland in September/October 2015)...Posted 6 straight multi-hit games, Aug. 14-20, batting .480 (12x25) with 4 runs, 2 doubles, 1 home run and 3 RBI…equaled the longest such streak of the season (also: Xander Bogaerts, Jackie Bradley Jr., J.D. Martinez, Kendrys Morales & Trea Turner)…equaled the longest such streak of his career (also: 6, 8/4-9/1/13 w/BAL)...Had 5 home runs in 3-game series at Tampa Bay on May 13-15…2nd Oakland player with 5+ in 3-game series (also: Mark McGwire, 3x, last: 6/9-11/95 at BOS)...On 15-day disabled list, April 21 - May 6 with a strained left hamstring… appeared in 2 games on a rehab assignment with High-A Stockton. Began the season with Toronto and was batting .296 with seven home runs and 29 RBI in 58 games when he was claimed off waivers by Oakland Aug. 3…hit .284 with 11 home runs and 37 RBI in 47 games with the A's…combined for a .290 average, a career-high 18 home runs and 66 RBI in 105 games overall…his 37 RBI in 47 games with the A's are the most in Athletics history by a player with fewer than 60 games played…his 11 home runs match the most (Rico Carty, 41 games in 1978)…only three players in Oakland history had more RBI over their first 47 games with Oakland (Dye 47, Kingman 45, Payton 38)…made 45 of his 47 starts with the A's at third base (two at designated hitter)…made most of his starts with Toronto in left field (27)…overall, made 54 starts at third base, 27 in left field, two at designated hitter and one each in right field and at first base…also appeared in three games at second base…committed three errors as a third baseman, all with the A's…had a .980 fielding percentage in 55 games overall at third base, which was the highest mark among Major League third basemen with 50 or more games…also had one error as an outfielder…batted .298 (39-for-131) against left-handed pitching compared to .285 (61-for-214) against right-handers…hit 13 of his 18 home runs off right-handers for a .556 slugging percentage…entered the season with a .351 career slugging percentage against righties… has a .321 (206-for-641) career batting average against lefties compared to .237 (272-for-1146) against righties…had six home runs in 50 games before the All-Star Break, 12 in 55 contests after the break… batted .313 in his home ballparks and .301 during the day…has a .303 (257-for-848) career average at home compared to .235 (221-for-939) on the road…hit .400 in interleague play, which tied for the third best interleague mark in the majors…now has a .344 (62-for-180) career average against the National League compared to .259 (416-for-1607) against the AL…batted .322 with 12 of his 18 home runs against AL West competition…went 2-for-12 (.167) with a home run as a pinch hitter, all with Toronto… is 6-for-39 (.154) in the pinch in his career…started games in every spot in the order except first, second and ninth…saw his most action with 42 starts batting clean-up. Hit .240 (37-154) after joining TOR…14 of his 37 hits with the Blue Jays went for XBH (11-2B, 1-3B, 2-HR)...Hit .321 with an .835 OPS vs. LHP, with eight doubles, one triple, and two home runs in 112 AB, 124 PA...In home games, hit .301/.351/.407/.757 in 123 AB, 134 PA… On the road, hit just .220/.247/.340/.587 in 141 AB, 150 PA...Had two season-high seven game hit streaks, the second of which lasted from 9/8-15...Stole his 1st base since May 8, 2011 at BOS Sept. 27 vs. BAL...Snapped a 0-for-16 with a bases loaded 2R-2B Sept. 20 at NYY. Danny had four stints with the Orioles, spending the final six weeks of the season in the Majors... Batted .371 with a .639 slugging percentage vs. left-handed pitching...led the A.L. in batting average vs. LHP,while ranking third in slugging percentage (minimum 100 plate appearances)... Hit .385 (35-for-91) combined in August and September, including nine multi-hit games in an 11-game stretch August 4-September 11)...homered in back-to-back games, May 24-25 at Toronto, the fourth time he's done that in his career... Recorded a season-long seven-game hitting streak, June 2-16, batting .360 with three doubles and two homers... Hit .286 in 65 games with Norfolk (AAA) with 14 homers and 51 RBI...his .531 slugging percentage would haveranked second in the International League, had he reached the minimum number of at bats. Made the Twins Opening Day roster for the first time in his career...hit his first home run in the third game of the season, April 3 at Toronto...Hit home runs in consecutive games: May 20 and 21 at Arizona and again June 17 and 18 vs. San Diego...six of his 15 home runs came against the National League...Drove in the game-winning run with a single in the bottom of the 10th inning, May 28 vs. Los Angeles (AL)...Recorded his second game-winning hit, driving in two runs in the bottom of the ninth inning, July 19 vs. Cleveland...Hit safely in 18 of 19 games, July 18-August 6, including a career-high 11-game hit-streak, July 18-27...Batted .303 (33-for-109) with six doubles, four home runs and 20 rbi in 28 July games...Batted .471 (8-for-17) with 17 rbi with the bases loaded, which ranked as the ninth-best bases loaded average in the American League...Batted .309 (46-for-149) off left-handed pitching...His 18 errors at third base were the most errors for a Twins third baseman since Gary Gaetti committed 18 in 1990...Led club in games played, playing in 154 of the Twins 162 games...also led the club in at-bats and rbi...His 147 games played at third base were the most for a Twin since Corey Koskie played in 150 in 2001...ninth-most at third in Twins history...Became the third third baseman in club history with 15 home runs and 25 doubles in a season, joining Gary Gaetti (1982, '83, '85, '86, '87, '88, '90) and Corey Koskie (2001, '02)...Led the American League in games played at third base and tied Milwaukee's Casey McGehee for most games played at third base in all of baseball...his 134 hits as a third baseman were tied for second in baseball, behind the Cubs' Aramis Ramirez (169) and tied for first in the American League with the Angels' Alberto Callaspo. Started the season in Triple-A Rochester, batting .292 (54-for-185) with 15 doublesin 49 games with the Red Wings...Named Twins Minor League Player of the Week, for the week ending on May 14...batted .391 (9-for-23) with three doubles, five rbi, and four runs scored in six gamesfor the Red Wings...Was recalled by Minnesota, June 3...to take the roster spot of Michael Cuddyer, whowas placed on bereavement leave...Made his first career start, and singled off Felix Hernandez for his first Major League hit, June 3 vs. Seattle...Had bases loaded rbi single for first career rbi, June 16 vs. Colorado...Became first player in club history to hit a grand slam for first career homer (off Greinke), had first career four-hit game, career-high fourrbi and career-high four runs scored, July 26 at Kansas City...the homer was his first of the season after not hitting one in 49 games atRochester...collected two hits in the sixth inning of that game...Had second career four-hit game, going 4-for-5 with a double and three rbi, July 27 at Kansas City...Had 14 hits in 19 at-bats, with eight rbi and six runs scored in a four-game stretch, July 24-27...Batted .453 (24-for-53) with six doubles and 11 rbi in 16 games in July...Had career-high seven-game hit-streak, batting .462 (12-for-26) during the span, August 13-20...Committed just one error in his first 48 games with the Twins (113 total chances), posting a fielding percentage of .991 during that span...Hit second home run of season and first at Target Field (off Jered Weaver), August 22 vs. Los Angeles (AL)...Had game-winning, walk-off single in the bottom of the 10th inning, September 1 vs. Detroit...Collected 10 hits in 16 at-bats, August 31-September 3...Went 2-for-3 with a home run, September 17 vs. Oakland and 2-for-4 with a home run, September 18 vs. Oakland...according to the EliasSports Bureau, Valencia was the first Minnesota rookie to produce back-to-back multi-hit games, with a home run in each, since JasonKubel, September 21 and 22, 2004 at Chicago (AL)...Went 2-for-7 with two home runs and a career-high five rbi, September 25 at Detroit...one home run was a grand slam, the second of hiscareer...it marked the first multi-homer game of his career...he became the first Twin since Gary Gaetti (1982) to hit two grand slams in hisrookie season (Elias Sports Bureau)...had two of the Twins four grand slams on the season...Batted .386 (51-for-151) with 11 doubles, four home runs in 39 home games, hitting safely in 30 of 39 games at Target Field...Batted .322 (47-for-146) against the American League Central...hit .459 against Kansas City, .367 against Detroit and .325 against Chicago...Played in 85 games, helping the Twins go 50-35 when he was in the lineup, 40-15 when he got a hit, and 22-4 when he drove in a run...Named to the Topps Major League Rookie All-Star Team...named to Baseball America's All-Rookie Team...Finished third in the American League Rookie of the Year voting with 12 points (one second-place vote and nine third-place votes), behindTexas' Neftali Feliz and Detroit's Austin Jackson...Recipient of the Bill Boni Award for Twins Most Outstanding Rookie, voted on by the Twin Cities chapter of the BBWAA. Began season at Double-A New Britain...named Twins Minor League Player of the Week, April 24...named Eastern League Player of the Week, May 18...had 13-game hitting streak, including three home runs, 15 RBI and eight multi-hit games, May 1-24...batted .373 with 18 RBI in 20 May games...promoted to Triple-A Rochester, June 23 and went 3-for-5 with two RBI in his first game with the Red Wings that same day vs.Columbus...collected 10 hits in his first 22 at-bats with Rochester and 17 hits in his first 42...appeared in 71 games for the Red Wings, playing third base in 68 of those games...combined to bat .285 (139-for-487) with 38 doubles, four triples, 14 home runs, 70 RBI and 79 runs scored in 128 games between the two levels...his 38 doubles and 227 total bases led all Twins minor leaguers...batted .309 (50-for-162) vs. lefties on the season...played in the Puerto Rican Winter League...ranked as the sixth-best prospect in the Twins organization by Baseball America, entering the 2010 season. Began season with Single-A Ft. Myers...hit safely in 14 of 15 games, going 21-for-58 (.362), April 20-May 5...had 10-game hit-streak, going 19-for-36 (.528), May 9-23...hit safely in seven consecutive games, June 2-8...selected to Florida State League All-Star Game, June 14 at Brevard County...promoted to Double-A New Britain, June 16...had 13-game hit-streak, going 19-for-54 (.352), July 5-18...hit safely in season-high 15 consecutive games, going 20-for-56 (.357), August 16-31...Twins Minor League Player of the Week, August 29-September 5...had two-homer game and season-high five rbi, August 31 vs. Binghamton...played for Phoenix in the Arizona Fall League. Began season at Single-A Beloit...hit safely in nine consecutive games, going 14-for-34 (.412), April 13-23...had season-high 11-gamehit-streak, going 16-for-41 (.390), May 11-22...homered in consecutive games, June 1-2...promoted to Single-A Ft. Myers, June 22...had season-highfour hits, July 13 vs. Jupiter...homered in consecutive games, July 17-18...had nine-game hit-streak, July 30-August 8...had 10-game hit-streak,going 16-for-39 (.410), August 14-26...season-high four rbi, August 22 vs. Dunedin. Spent first professional season at Rookie-Level Elizabethton...hit safely in eight of nine games, going 11-for-31 (.355), July 13-21...season-high four hits and four rbi, July 29 vs. Greeneville...had nine-game hit-streak, going 16-for-36 (.444), July 27-August 5...had season-high13-game hit-streak, going 20-for-60 (.333), August 7-20...was fifth in Appalachian League in home runs and 10th in batting. August 15, 2018 Baltimore Orioles released 3B Danny Valencia. August 10, 2018 Baltimore Orioles designated 3B Danny Valencia for assignment. June 1, 2018 Baltimore Orioles activated 3B Danny Valencia from the paternity list. May 30, 2018 Baltimore Orioles placed 3B Danny Valencia on the paternity list. 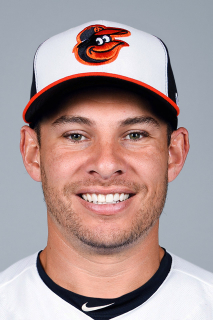 March 29, 2018 Baltimore Orioles selected the contract of 3B Danny Valencia from Norfolk Tides. March 3, 2018 Baltimore Orioles signed free agent 1B Danny Valencia to a minor league contract and invited him to spring training. March 3, 2018 1B Danny Valencia assigned to Norfolk Tides. November 2, 2017 1B Danny Valencia elected free agency. November 12, 2016 Oakland Athletics traded 1B Danny Valencia to Seattle Mariners for RHP Paul Blackburn. May 6, 2016 Oakland Athletics activated 3B Danny Valencia from the 15-day disabled list. May 2, 2016 Oakland Athletics sent 3B Danny Valencia on a rehab assignment to Stockton Ports. April 22, 2016 Oakland Athletics placed 3B Danny Valencia on the 15-day disabled list retroactive to April 21, 2016. Strained left hamstring. August 4, 2015 Oakland Athletics activated 3B Danny Valencia. August 3, 2015 Oakland Athletics claimed LF Danny Valencia off waivers from Toronto Blue Jays. August 1, 2015 Toronto Blue Jays designated LF Danny Valencia for assignment. July 29, 2014 Toronto Blue Jays activated 3B Danny Valencia. July 28, 2014 Kansas City Royals traded 3B Danny Valencia to Toronto Blue Jays for C Erik Kratz and RHP Liam Hendriks. June 22, 2014 Kansas City Royals activated 3B Danny Valencia from the 15-day disabled list. June 17, 2014 Kansas City Royals sent 3B Danny Valencia on a rehab assignment to Omaha Storm Chasers. December 18, 2013 Baltimore Orioles traded 3B Danny Valencia to Kansas City Royals for LF David Lough. August 19, 2013 Baltimore Orioles recalled Danny Valencia from Norfolk Tides. August 6, 2013 Baltimore Orioles optioned Danny Valencia to Norfolk Tides. August 4, 2013 Baltimore Orioles recalled Danny Valencia from Norfolk Tides. July 25, 2013 Baltimore Orioles optioned Danny Valencia to Norfolk Tides. July 24, 2013 Baltimore Orioles designated Danny Valencia for assignment. July 19, 2013 Baltimore Orioles recalled 3B Danny Valencia from Norfolk Tides. July 3, 2013 Baltimore Orioles optioned Danny Valencia to Norfolk Tides. May 19, 2013 Baltimore Orioles recalled Danny Valencia from Norfolk Tides. March 21, 2013 Baltimore Orioles optioned Danny Valencia to Norfolk Tides. November 28, 2012 Boston Red Sox traded 3B Danny Valencia to Baltimore Orioles. November 20, 2012 Boston Red Sox designated Danny Valencia for assignment. September 21, 2012 Boston Red Sox recalled 3B Danny Valencia from Pawtucket Red Sox. August 21, 2012 Boston Red Sox optioned Danny Valencia to Pawtucket Red Sox. August 11, 2012 Boston Red Sox recalled Danny Valencia from Pawtucket Red Sox. August 8, 2012 Danny Valencia roster status changed by Pawtucket Red Sox. August 5, 2012 Minnesota Twins traded 3B Danny Valencia to Boston Red Sox for OF Jeremias Pineda. August 5, 2012 Boston Red Sox optioned 3B Danny Valencia to Pawtucket Red Sox. July 28, 2012 Minnesota Twins recalled Danny Valencia from Rochester Red Wings. May 10, 2012 Minnesota Twins optioned Danny Valencia to Rochester Red Wings. June 3, 2010 Minnesota Twins recalled Danny Valencia from Rochester Red Wings. March 20, 2010 Minnesota Twins optioned Danny Valencia to Rochester Red Wings. February 1, 2010 3B Danny Valencia assigned to Puerto Rico. December 14, 2009 3B Danny Valencia assigned to Indios de Mayaguez. November 20, 2009 Minnesota Twins selected the contract of Danny Valencia from Rochester Red Wings. June 23, 2009 Danny Valencia assigned to Rochester Red Wings from New Britain Rock Cats.